We love getting discounts and special offers for our clients, so in the run-up to “Black Friday” we have worked with our registry partners to get some really nice pricing on some domain extensions. 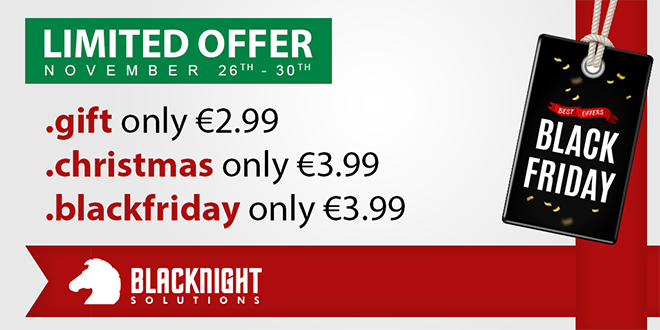 NB: these prices are only valid for a very short period of time – when the offer is over it is over. These prices are valid between November 26th and November 30th 2016. Prices are ex-VAT. Looking for other offers and discounts? Keep an eye on our Twitter, Facebook and special offers for updates from us.